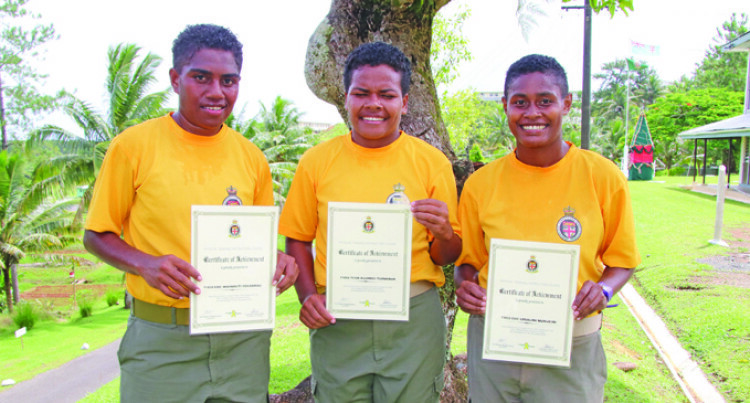 Three women of the Fiji Cor­rections Service were proud recipients of the World Rug­by physical training instructors and Level One strength and condi­tioning certificates yesterday. Losalini Nukuciri, 26, from the Lautoka Women’s Corrections Center, Alumeci Tuinabua, 27 from National Headquarters and Waini­kiti Vosadrau, 25 of the Suva Wom­en’s Corrections Center, were part of the 22 participants who graduat­ed after a gruelling 6- week course. This is the second group to under­go this new course in the history of the Fiji Corrections Service which is tailor-made to help the men and women in their respective institu­tions fit, assist other sports like rugby. Nukuciri, who hails from Votu­alailai in Nadroga, understands fully well the value of the training she has experienced. “I come from an area in Fiji where rugby is like a religion. I am glad that the course has equipped me with the knowledge to be able to train rugby players and even other sports,’’ she said. Tuinabuna, who hails from Namu­ka, Tailevu, said the challenge now was to apply the practical aspect of their training when they return to their various centers. The 22 that graduated comprised of personnel from all Corrections Centers from around the country who will now return to their vari­ous posts to put their new found knowledge to the test. One of the main course facilita­tors was Naca Cawanibuka, the Fiji Rugby Union strength and condi­tioning coach. “This as this is the second year we have come to the Fiji Corrections Service. These officers will be post­ed back to their centers around Fiji and will take with them what they have learnt to their work place and also their communities. “This is the outreach programme we are trying to fast track for rugby, where we have qualified training coaches at grassroots level and that is where Fiji Corrections Service is making a contribution to Fiji as a whole as part of nation building. Commissioner of Corrections Commander Francis Kean said this was part of their contribution to nation building and helping pro­mote a healthy and fit working en­vironment. “Sports now offers a pathway to a better future so if we can teach our rugby players or athletes proper training methods from community level it will boost their performance in the long run,’’ Commander Kean said. Commander Kean said now the opportunity is open for the current graduates to go to their various posts and practice what they have learnt and return next year to un­dertake their Level 2 certification.